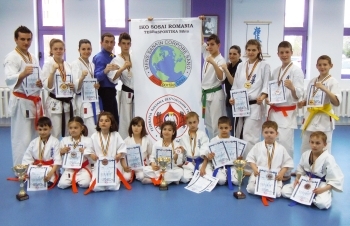 Terrasportika Sibiu was founded in 2005, in order to share with the eager participants the techniques of the Kyokushinkai martial art. The performances achieved throughout time in our club are a proof of the training seriousness and perseverance. Whether a local, national or European championship is at issue, our sportsmen have performed brilliantly, obtaining the first ranks of the podium, bringing to the club medals. The club has developed and, at present, it provides, apart from karate classes and training, Tae Bo, TayGym & Stretching sessions for those eager to be active and to keep in excellent shape. In line with our motto “Mens sana in corpore sano” we invite you, no matter your age, to work out with us!